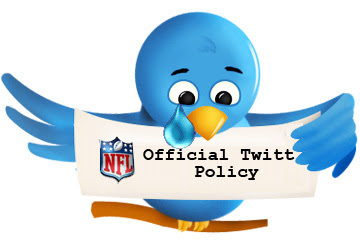 The National Football League (NFL), much to Chad "Ocho Cinco" Johnson's probable dismay, has issued a formal Twitter blackout policy on game days for coaches and players. According to the San Francisco Business Times, the "policy also prohibits posting of messages by someone representing a player or coach during the blackout time starting 90 minutes before a game and continuing until its end." The SFBT also reports that "NFL referees and other officials are banned from using Twitter at all" and that it "prohibits posting of messages by someone representing a player or coach during the blackout time starting 90 minutes before a game and continuing until its end." What is not clear is how "other officials" and "someone representing a player or coach" is defined. In the latter case, does this mean posting to that player or coaches twitter account by an agent or team employee? Does it mean that an agent cannot post to their own Twitter accounts and mention a specific player or coach by name? Without reading the full policy, it would be premature to comment on the policy.